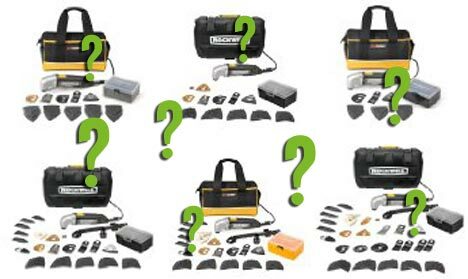 Tool Blog Questions Reader Question: SoniCrafter, Which Set Should I Buy? I received a question from a reader who was having a hard time selecting the right SoniCrafter set. I thought I would post the question in case other people were having the same issue. As of now Rockwell has six different sets available on Amazon, so choosing the right set can be challenging. I read the review your wrote on the Rockwell Sonicrafter 72-piece set, which I found quite helpful. I am interested in purchasing one as a gift and was wondering what your recommendation would be. Do you feel there is anything the 72-piece set contains that is beneficial that the 45-piece or 37-piece set does not have? You mentioned the 72-piece set has a fair amount of sanding paper and I am wondering if you feel it is worth the added cost. Also, the 72-piece kit has a cloth bag while the 73-piece kit has a hard plastic storage. Is one more beneficial/convenient than the other? I am lost when it comes to making a tool purchase but, I do want to give a lovely gift. I would greatly appreciate your input. I am glad the review has been helpful to you. The accessories that are missing from the smaller kits appear to be the smaller sanding pad, the two rasps, and the polishing pad. While the sanding papers do bring the accessory count up, it appears that they do not really increase the price of the kit. The rasps themselves cost around $20 each, so those two alone would bring the price up to the 72-piece kit range. If you plan on removing tile, these rasps are key. The hard case should offer more protection for the tool, and probably a little more organization for the accessories. With the bag, things can jump around a bit. I tend to lean in the hard case direction, but I have not had problems with the bag. The 73-piece hard case kit only cost $1.50 more then the 72-piece kit at Amazon, and it does include an extra blade. So if you plan on getting the 72-piece kit, you might as well just move up and get the 73-piece kit. Basically it comes down to what you plan on doing with the kit. If you want to do everything that is shown in the infomercials, you need to get one of the larger kits. If you just want to do some basic cutting and sanding, the smaller kit is for you. Also keep this in mind, Rockwell makes their money of off their accessories. In this case, it is a lot cheaper to buy more upfront, then to wait and buy them later.